Enter your details, then click the "Calculate" button. Enter your loan amount, annual interest rate, and number of years that you wish to pay this mortgage. Then simply click on the Calculate button. Our loan calculator will compute your monthly Principal and Interest payments for you loan. Database Systems Corp. provides mortgage marketing applications and loan tracking software for mortgage prospect lead tracking. This loan calculator application is completely integrated with our phone systems which can perform both inbound and outbound mortgage marketing campaigns. Our mortgage software application was developed using TELEMATION, our award winning contact management software application toolkit. 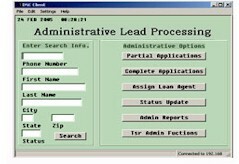 This CRM software tool is ideally suited for processing mortgage loans and managing customer information. This CRM application is employed in a wide variety of organizations including contact centers, help desks, customer service centers, service bureaus, reservation centers and corporate call centers. Contact DSC to learn more about our mortgage software applications and mortgage loan calculators. An important benefit of today's telecommunication advancement is the ability for your employees to work from home. Database Systems Corp. has developed a family of telecom products that promote this capability. Our call center phone system, combined with our mortgage marketing application software and computer telephony products, fully supports remote agents and work at home employees. Mortgage loan officers can now work from various remote offices within your organization. Your mortgage loan officer pool can be significantly expanded with the addition of work at home employees. The economic savings and environmental advantages are significant. To obtain additional information about remote agent capability, you may visit our Virtual Call Center. Contact DSC to learn more about our mortgage calculator and mortage marketing software.